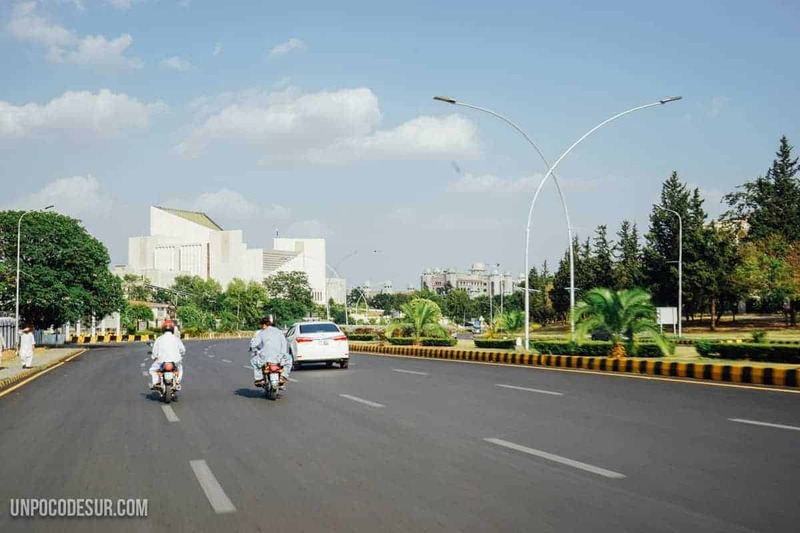 1 How to move around Islamabad? 2 What to do in Islamabad? 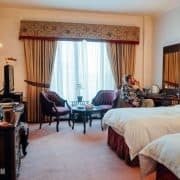 4 Where to sleep in Islamabad? Islamabad is Pakistan’s bureaucratic capital, in fact, it is a planned city. Do you know Brasilia? Well, something like that, although this time at least has not been left out opposite to the example grows every day and as the country’s operational centre. Islamabad has just 2 million inhabitants, which are nothing compared to the 14 million living in Karachi or other cities in the country. Its size and history make it easy to visit and easy to manage, very similar to European cities in many ways but without the character that represents the majority of Pakistani society. It’s still very likely that your trip will end at some point in Islamabad, either because it is at a strategic point for starting a route to the north of the country, or to fix paperwork, permits and all kinds of bureaucratic formalities. So hey, if that’s your case please find here a guide to have amazing plans during those days (besides the visits to the visa centre). Islamabad is a nice place but you need to know where to go if you don’t want to get bored. Moving around the city is very easy thanks to the numbering of its streets, similar to the one found in North and South American cities. How to move around Islamabad? Being a planned city, and in addition, the most important of the country at the bureaucratic level, Islamabad has a transport system worthy of a worldwide city (it lacks much to resemble European cities but it is a good start). Thanks to the Metrobus we can connect more than 20 km between the cities of Rawalpindi and Islamabad with a single line. The route covers more than 24 stations and was recently opened, just two years ago (in July 2015). 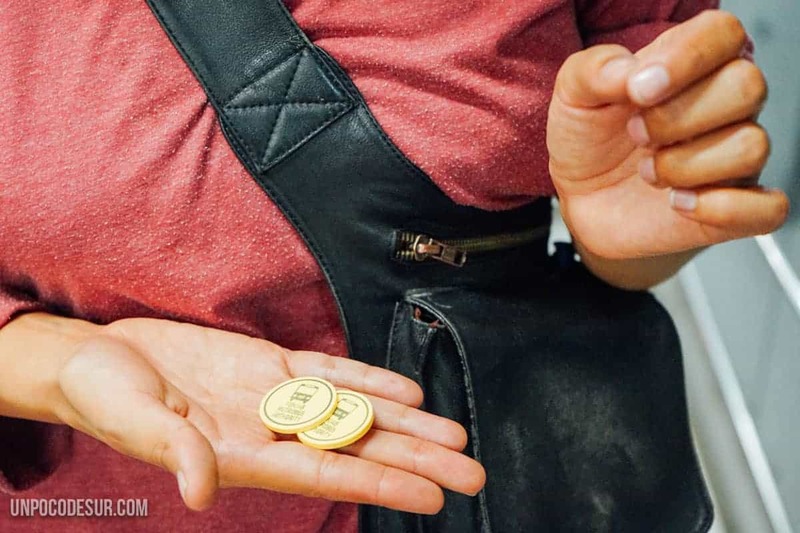 Is a smart ticket system using “tokens” which can be purchased at the same station and have various prices depending on the time and number of stations you take. We used it very often and it is a perfect way to avoid the crazy traffic because its lanes are dedicated or high, the price is about 50 rp per route. What to do in Islamabad? One of the most impressive mosques in the world, not only by its size but by its complete architectural difference with other of its kind with a modern design inspired by Bedouin tents. A symbol of the city and a mark on its horizon. The Faisal mosque began its construction in 1976 with the idea of hosting more than 10.000 people at the same time under its roof. In fact, it was the largest mosque in the world until 1993. Still, if not because of its size, is worth approaching because of its looks. It is possible to visit it inside, we were around in prayer time and during these periods it is impossible (and understandable). 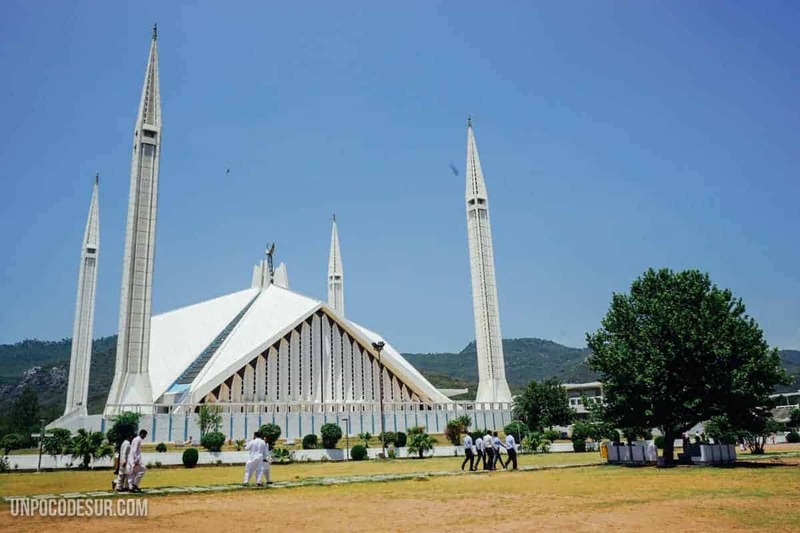 How to get to the Faisal mosque? You can do it using metro cable down at the eighth avenue station. You can enter free besides on Fridays or in prayer periods. Its name is composed of the terms “Mar ” and “galla”. “Mar” means snake in Pashto and Farsi and “Galla” means herd. So you can make an idea that the area is full of snakes including a large number of poisonous snakes like cobras. Yeah, don’t be afraid, human access made them back to areas much less crowded, we did not see a single one during our visit. While Islamabad is a considerably green city (thanks to its planning), no city is green enough for us, so a good plan is to escape to the mountains, especially when they are offering such an impressive view. They also include trekking routes for walking lovers, one of the easiest routes It’s the one linking the zoo to Daman-E-Koh. Please do not support animal tourism visiting the zoo. 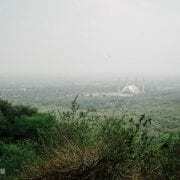 How to get to Margalla Hills? We know that there is a bus from the supermarket in the f-6 District that crosses the hills, but we did not see it, we had our motorbike with us. (bought, another story for another day) I’m sure it is possible to rent a motorcycle for a day or a car with driver or without it. Remember services like uber or careem exist in Pakistan and will make your life a lot easier. 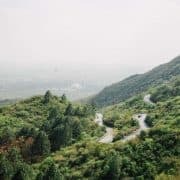 We recommend a whole day in Margalla Hills, relax, and enjoy the public services in the area (is easy to find restaurants, restrooms and other facilities). Remember, bring always loads of water with you. If you still feel greener then don’t hesitate to pay a visit to the lake that conquers the city. The Rawal Lake is an artificial reserve that provides water to the city of Islamabad and its sister Rawalpindi, the water is being held from the hills. It is an ideal place for walks, a small picnic or even some aquatic activity. How to get to Rawal lake? Being a city without so much hustle it is possible to enjoy calm at night, a calm you won’t see in any other cities in the country. At night some of its great avenues are then transformed into cricket playing fields in which dozens of teams of all ages compete at the same time informally. It’s very interesting and fun to sit with something to eat to watch and enjoy the festive atmosphere that is generated during the game. Right next to Islamabad you will find its older sister, chaotic and much more aligned with the rest of the country. Rawalpindi has 3 million inhabitants and is connected to Islamabad thanks to the metro bus so you can make raids between the two cities at a very low price. On the other hand, the rickshaws are back in Rawalpindi (not allowed in Islamabad) so reaching some corners will be much easier. 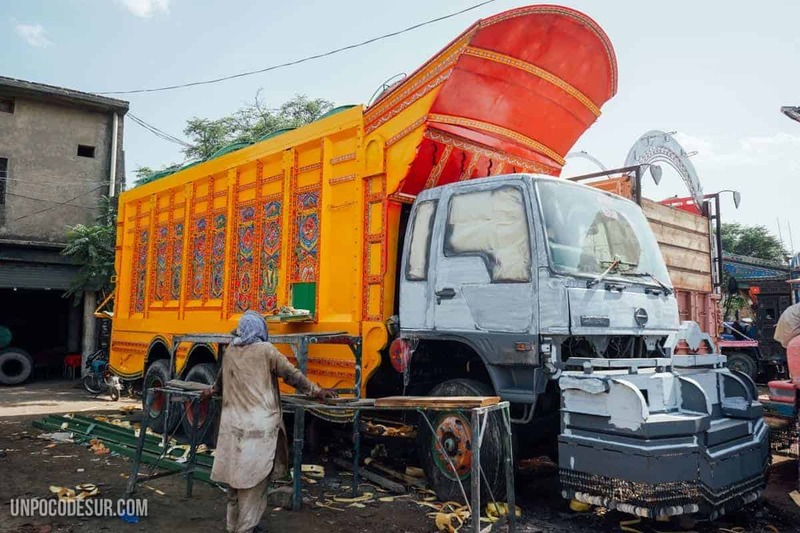 In Rawalpindi, you will also be able to visit some of the famous of Pakistan’s truck painters, without a doubt a memorable experience. Where to sleep in Islamabad? 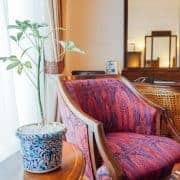 The hotel also features spa and pool services and the most usual hairdressing and laundry services of any other luxury hotel. It is important to emphasize the role of Serena Hotels in the local economy and in the development of its communities, most of its staff are made up of people from the area (in the case of Islamabad is simple but not in the case of more remote heritage hotels) and a big part of their profits are invested in the development of the area. Responsible travel is a perfect way to collaborate in such a beautiful country and as unfairly punished as Pakistan. If your budget is lower in Islamabad you can find guest houses from 3000 rupees per room. If your budget is even tighter then you’ll have to stay in Rawalpindi and make the transport between the two every day.